This Property is 100 Pct. Non-Smoking. Guests of the Embassy Suites Palm Desert hotel enjoy their stay in one of our 198 spacious two-room suites with either majestic mountain or lush courtyard views. Included with your suite is a complimentary cooked-to-order breakfast and a nightly Manager*s Reception. This full-service upscale all-suite resort hotel is located in the heart of Palm Desert California just minutes from Fabulous shopping at the renowned El Paseo Shopping District Westfield*s Palm Desert Town Center and the River 100 golf courses many of which are stops on the PGA tour such as PGA West Desert Willow Classic Club - Indian Wells Country Club and many more A variety of restaurants such as Ruth Chris LG*s Steakhouse the Chop House Mama Gina Castelli*s Casino gaming at the Agua Caliente Casino Augustine Casino Fantasy Springs - Spotlight 29 World renowned medical facilities the Betty Ford Center the Annenberg Center for Health Sciences and the Eisenhower Medical Center The Living Desert Wildlife and Botanical Park McCallum Theatre Indian Wells Tennis Garden Knott*s Soak City. On-site recreation at the Embassy Suites Palm Desert hotel includes Large outdoor pool with an adjacent whirlpool and spacious sun deck. 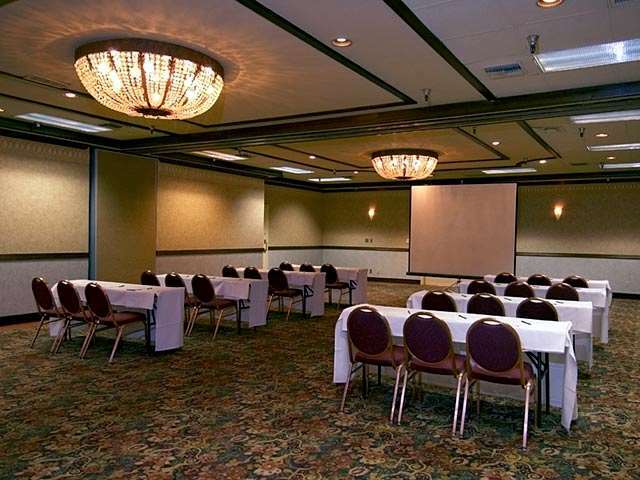 In addition to these amenities guests are welcome to enjoy spending some time on our 6 hard-court lighted tennis courts. Access to these beautiful courts is complimentary to all guests and reservations are available. We also have a tennis pro on-site available for private lessons and instruction. Contact the hotel to make your private lesson or court reservations today. The Embassy Suites Palm Desert hotel offers several specials packages to enhance the experience for guests who are traveling on either business or leisure. Click here for more information. Sonoma Grille: Serves lunch and dinner daily. Entrees include beef poultry fish and pasta dishes.